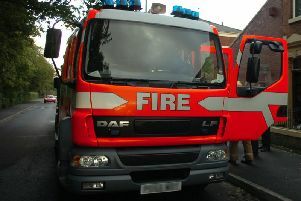 Firefighters saved a bed-bound woman's life after a fire broke out at a house in Lancaster last night. Wearing breathing masks, they searched the woman's Langdale Road home after it was reported she may still be inside, a Lancashire Fire and Rescue Service spokesman said. After finding her in the smoke-logged property, firefighters gave her oxygen before helping her outside where paramedics were waiting for her, the spokesman added. The blaze is understood to have broken out in the living room, with two crews from Lancaster and one from Morecambe called to tackle the flames using water jets at 8.35pm. The woman's condition was unknown this morning. The cause of the fire was being investigated.